The LK Bennett Leadon Patent Leather Grab Bag is a patent leather flap over style handbag with a single top handle which fastens with an elegant clasp. The taupe version of the bag has gold tone hardware and the black version of the bag has silver tone hardware. 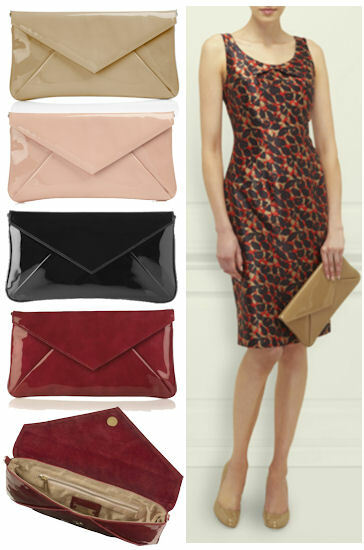 The clutch has a magnetic press stud fastening under the flap over. Inside, the bag has two fully lined compartments and there is a zip fastening pocket and leather label inside. This is a smart and ladylike medium sized handbag which works perfectly well over the 24/7 from desk to dinner. Patent leather is timeless and I always think the shiny leather is dressier than matte. In taupe or black, there is nothing that won’t team well with this lovely arm candy. The LK Bennett Lyne Patent Leather Tote Bag is a patent leather tote bag which is spacious and functional in addition to being incredibly smart. The tote has two top handles and silver tone hardware throughout. There is an external pocket on the front of the bag with a clasp fastening and the bag itself has a single main compartment with a secure zip fastening. Inside, the bag is lined there is a zip pocket and LK Bennett leather label sewn in. This is a smart day bag suited to day and weekend use. It’s chic yet spacious and would make a great daily use handbag, and teams well with some of the LK Bennett patent shoes including the Sledge Patent Courts. The LK Bennett Leola Clutch is a patent leather envelope clutch which also has a long shoulder strap which can be hidden inside the bag. This is a great day or evening clutch which coordinates well with the other patent accessories available at LK Bennett, including the belts and legendary Sledge shoes that the Duchess of Cambridge is so fond of. These clutches are available in a range of colours, although I would suggest that the taupe and the black are the most user friendly as they will literally go with anything. The new Chloe Angie bag for the AW2012/13 season has now been released and I have been able to find three versions of it. 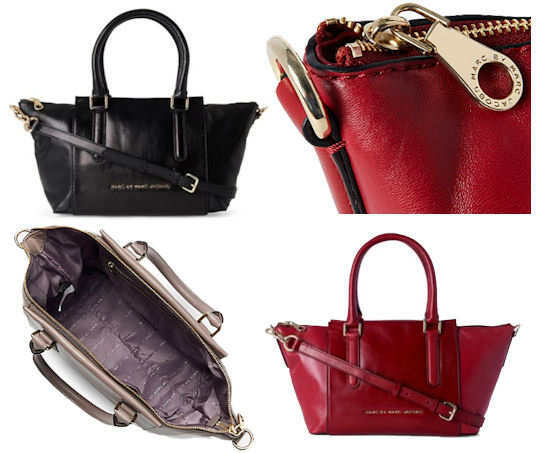 The red version above, from Flannels Fashion, is slightly smaller than the other two with shorter handles – more of a tote bag. However, it does come with a separate detachable and adjustable cross body strap. The black bag from Selfridges and two tone bag from Flannels Fashion and Harrods have a longer handle drop enabling the bag to be worn over the shoulder. The black bag has contrast stitch detailing in red; the two tone bag has a light sand coloured upper section and a darker taupe coloured lower section. 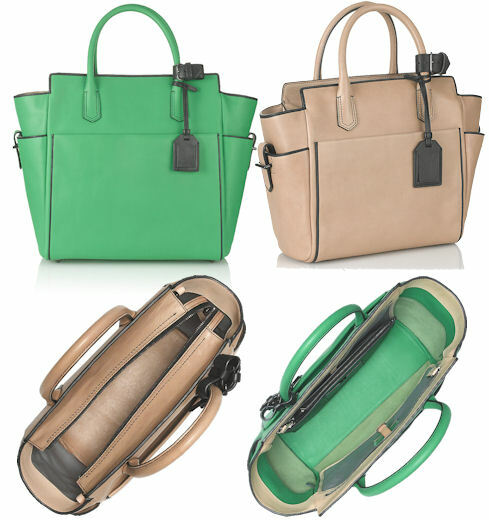 All three versions of the bag are similarly styled and shaped – they have two external alternate direction zip fastening pockets; the zip pulls feature the Chloe branding and have knotted leather thongs attached. All the metal hardware is polished gold in colour. The bags also feature an interesting double zip top fastening. The bag is fully lined in a bright fabric and there are two slip pockets inside, together with the Chloe brand label. All the bags are presented in a Chloe dust bag. Chloé’s carryall handbags are undoubtedly contemporary classics, and the new Angie bag is the label’s latest offering. Full of Parisian charm, the Angie bag is beautifully crafted from leather and accented with polished gold-tone hardware. It’s new, yet paradoxically it’s already timeless and certain to garner glances of admiration wherever you carry it. 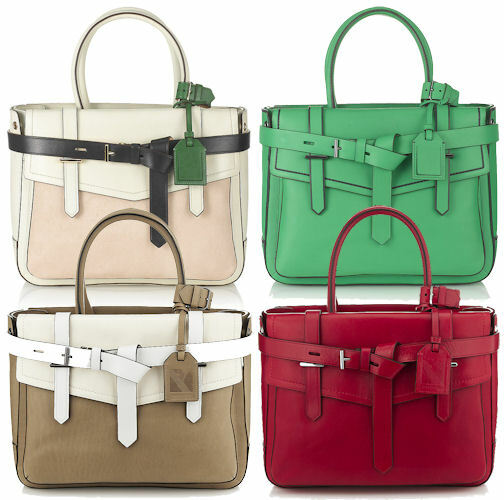 The Marc by Marc Jacobs Burg Boxer Satchel is a leather satchel bag available in three fashionable single colours. It is also available as a colour block bag. 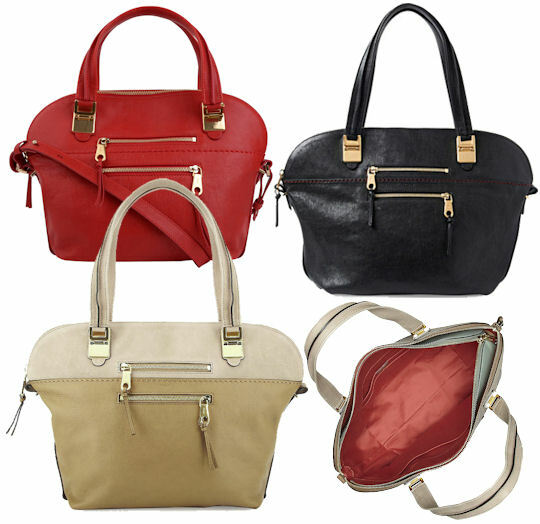 The bag features two structured top handles and a detachable, adjustable,shoulder / cross body strap. The bag features gold coloured metal hardware throughout, including the brand logo on the front of the bag. The bag has a top zip fastening and the zip pull is branded. Inside, it is fully lined in logo print fabric to match the exterior colour of the bag and there is one zip pocket and a slip pocket and a mobile phone pocket. Measurements: 22cm / 8.6″ x 30cm / 11.7″ x 14cm / 5.5″; all measurements are approximate. Add some sleek city style to your accessories closet with this leather satchel, which epitomises the look of the sassy New Yorker. The multiple carry options will let you style the bag however you want, and it will add a great sense of fashion to your daywear look. 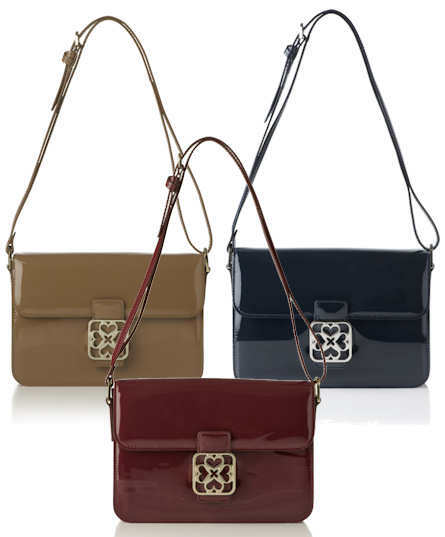 The LK Bennett Hexden Bag is patent leather shoulder bag availalbe in three colours. It has a long, adjustable shoulder strap which is long enough to also be an across body strap. It’s a flap over style, finished off with the LK Bennett Tudor Rose clasp and all the metal hardware on the bag is silver in colour. The inside of the bag is fully lined in satin and in the main compartment there is a zip pocket, a slip pocket and a leather brand label. There is a further small compartment at the front of the bag. 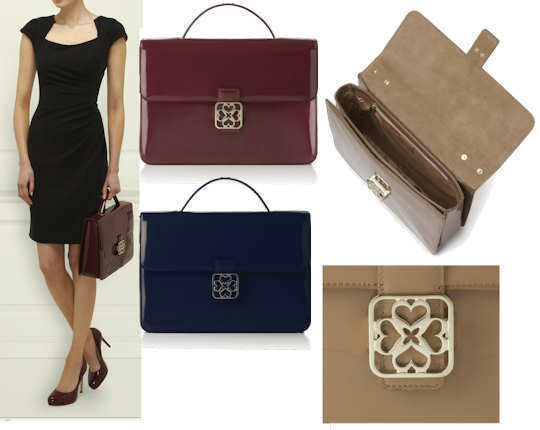 Elegant, structured and refined, the new season Hexden Bag from LK Bennett is both practical and charming. It will team well with both smart and casual outfits and can also make the transition to evening wear. Complete the look with a pair of LK Bennett patent heels, such as the Snake Print Harper Platforms. 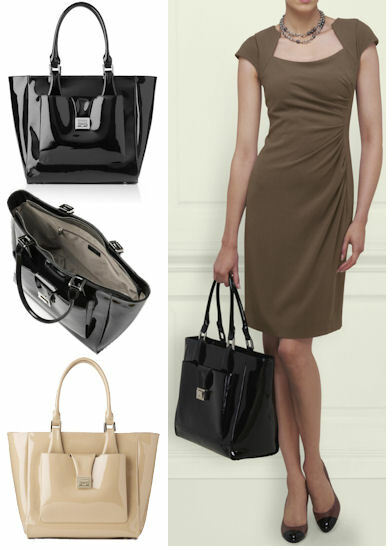 The LK Bennett Hayle Bag is a large, structured, patent leather handbag. It’s a flap over style and features the LK Bennett Tudor Rose clasp on the front. The bag has both a short grab handle and a removable shoulder strap for multiple carry options. All the metal hardware is silver in colour. The bag has a main compartment with a smaller compartment at the front. It is fully lined, and the main compartment has a zip fastening pocket and a leather brand label. This is a timeless and completely versatile bag for the new season. 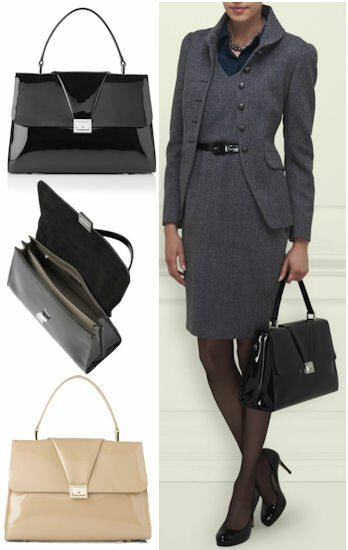 Structured and smart, the bag will take you seamlessly from work to weekend with enviable style. Complete the look with a pair of LK Bennett heels, such as the Harper Shoes or the Sledge Shoes in patent leather.